Big Environment wants to keep affordable energy out of Africa and away from the poorest of the poor. Moral? Hardly. Matt Ridley has some well-considered thoughts here. With the weather very quiet (yay!) for a few days and with global warming in the news, please let me recommend two items well worth your time. The Cornwall Alliance Letter to Pope Francis. Click here. The EcoModernist Manifesto's way forward (superb!). Click here. Most of the global warming cult wants to tear western society down (metaphorically live in the dark and starve) while it is OK for them to run around in private jets. I reject that. I want to built everyone up (most especially the poorest of the poor) as the EMM recommends. The Associated Press' in-house member of the climate cult, Seth Borenstein, brings us more climate silliness. These are the same computer models that, over and over and over again, run too hot. But, climate 'science' -- and Borenstein -- are impervious to that reality. The brown areas have a significant risk of tornadoes today. Well, we start today where left off last night. 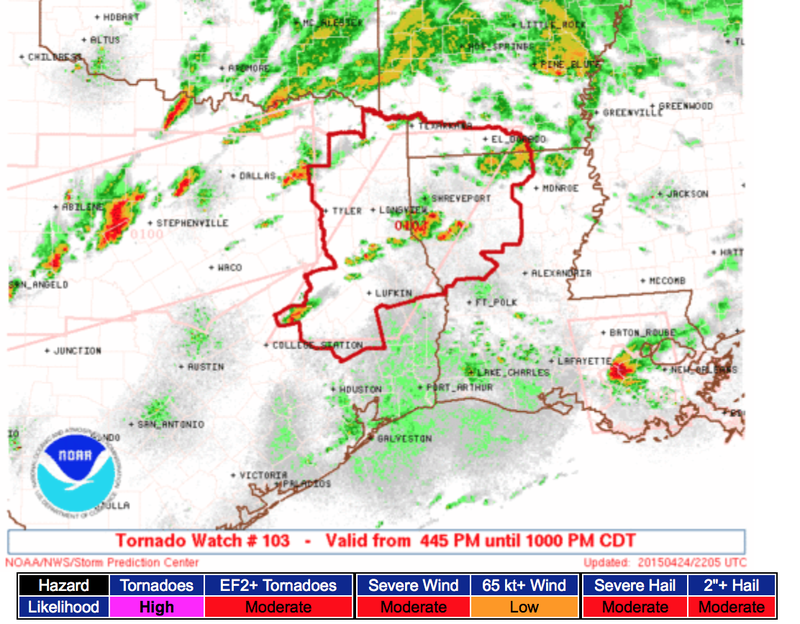 A tornado watch is in effect for Louisiana from the same line of storms that formed south of Ft. Worth about midnight. From my friend, Mark Bogner. AccuWeather has video (recommend watching full screen) of a tornado that forms close to a photographer who is then forced to run for his life. If a tornado is not changing angles but is getting larger, it is coming right at you! 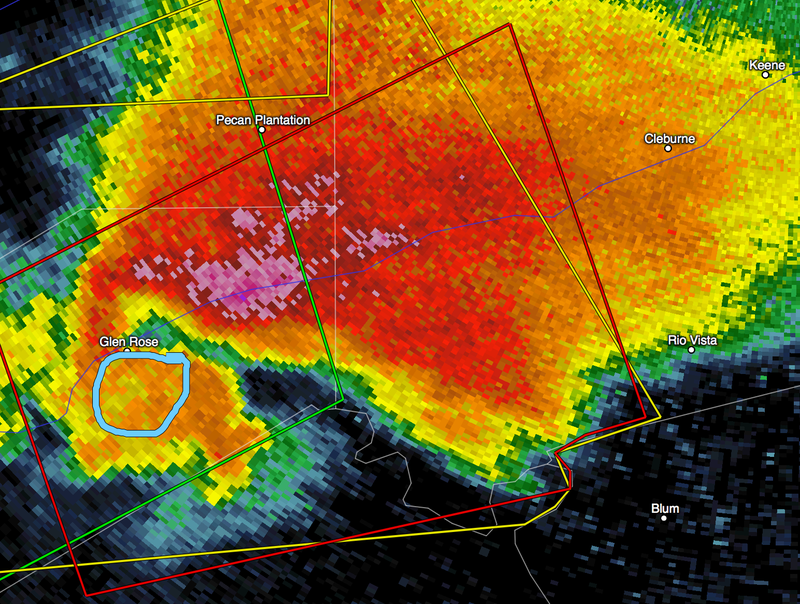 There is a tornado in the Blum-Rio Vista area moving east. Tornado warning (red polygon) continues in effect. More thunderstorms are developing to the southwest of the Metroplex. With the storms continuing to develop, a flash flood threat may develop during the night. Above is the radar at 9:49pm. 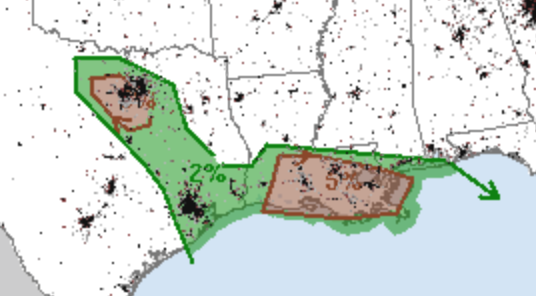 Green = flash flood warnings. Yellow = severe thunderstorm warnings (large hail and damaging winds). Red = tornado warning. This will be the last blog update for the night. I'll continue posting a while longer on Twitter @usweatherexpert. 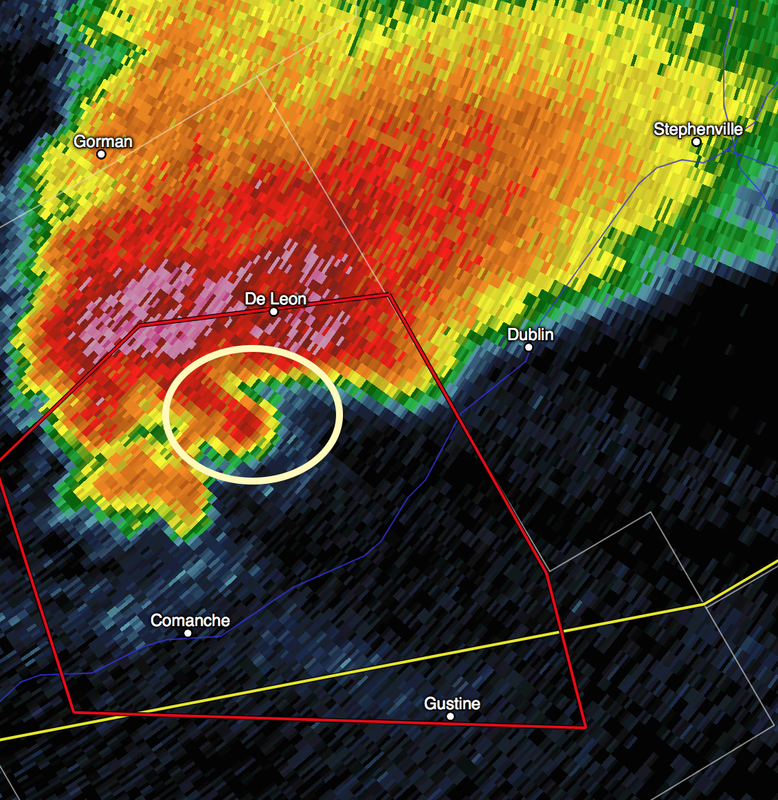 A confirmed tornado was located just south of Glen Rose about 10 min. ago. Radar at 9:15pm has is just south of US 67 moving ENE (circled). 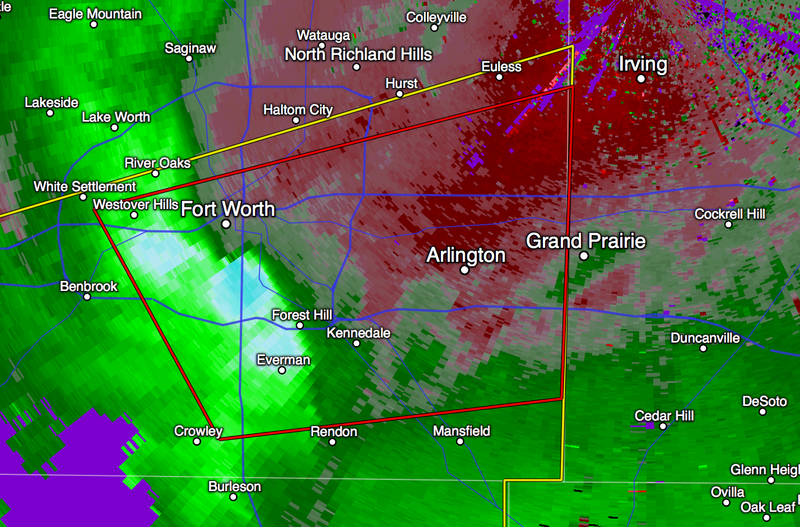 Radar shows this may be a strong tornado. Please make sure your friends and relatives in this region are aware of the threat and in shelter. 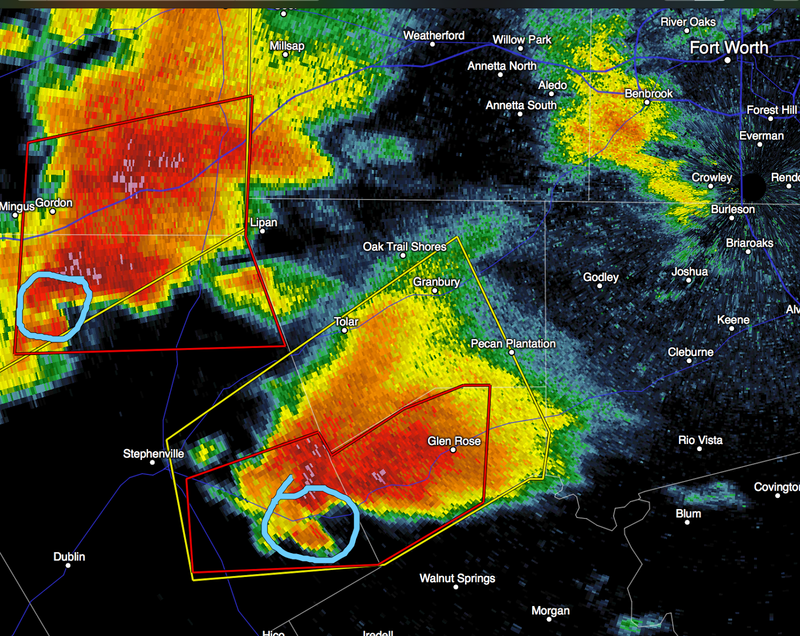 As of 8:27pm, we have two areas of rotation (circled) and two tornado warnings (red polygon). Ft. Worth is at the upper right hand corn of the image. These storms may last long enough to move into the Metroplex. 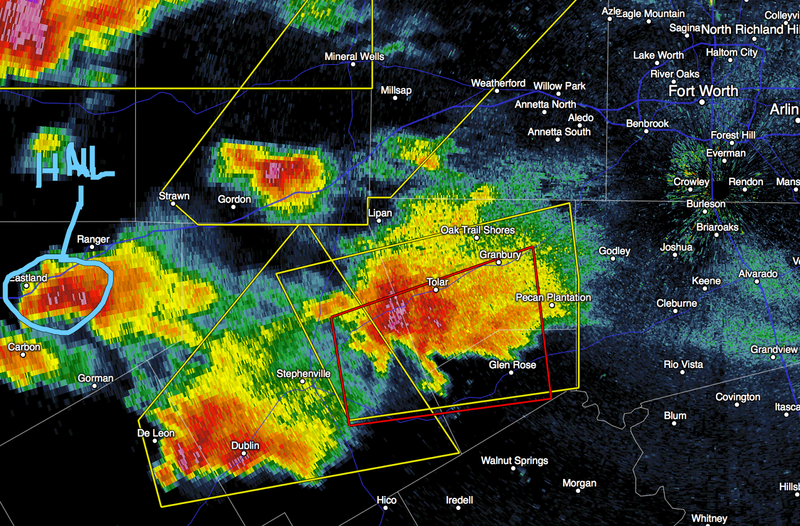 We now have three large supercells moving toward the Metroplex. 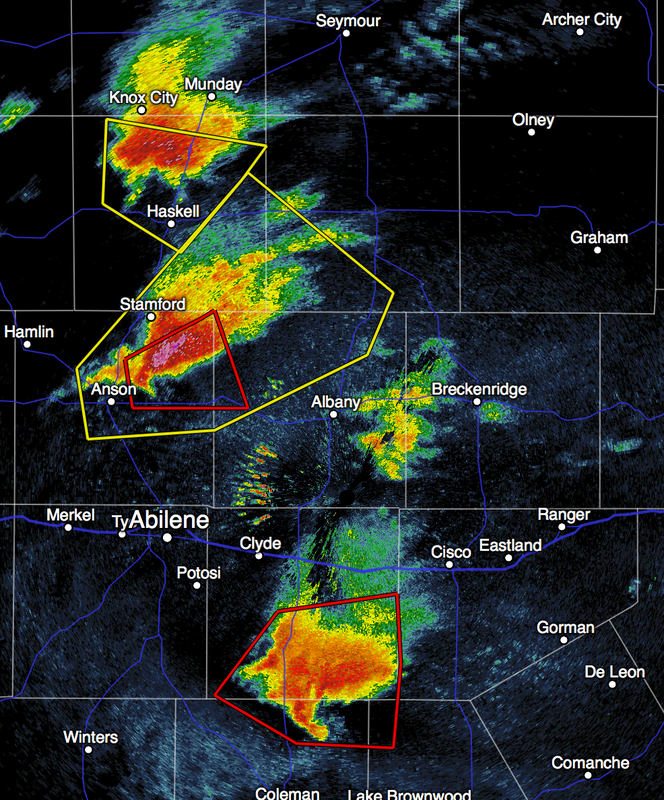 Each has large hail and the leading storm (red polygon) has a tornado warning. Please monitor for warnings as the storms approach. They are moving ENE to E.
Remember: I am tweeting @usweatherexpert. 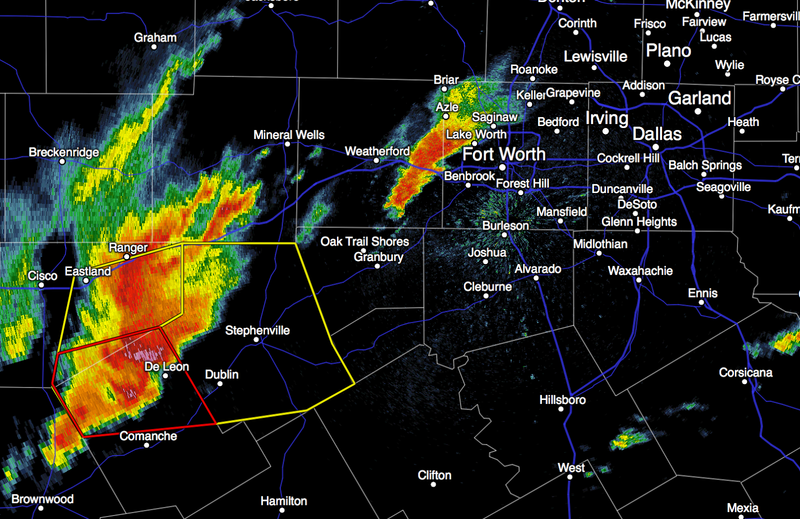 Most likely location of tornado (with softball-sized hail) is just southeast of Stephenville moving ENE to E at 6:43pm. 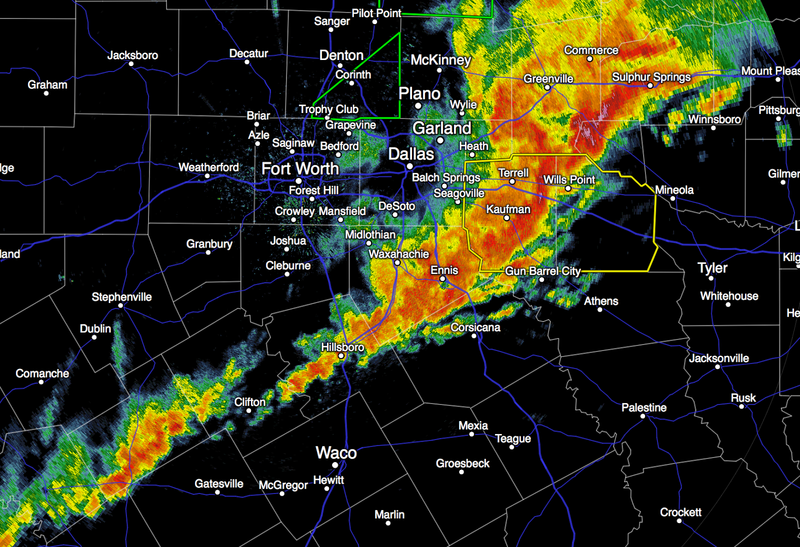 In general, thunderstorms have strengthened west and southwest of the Metroplex. 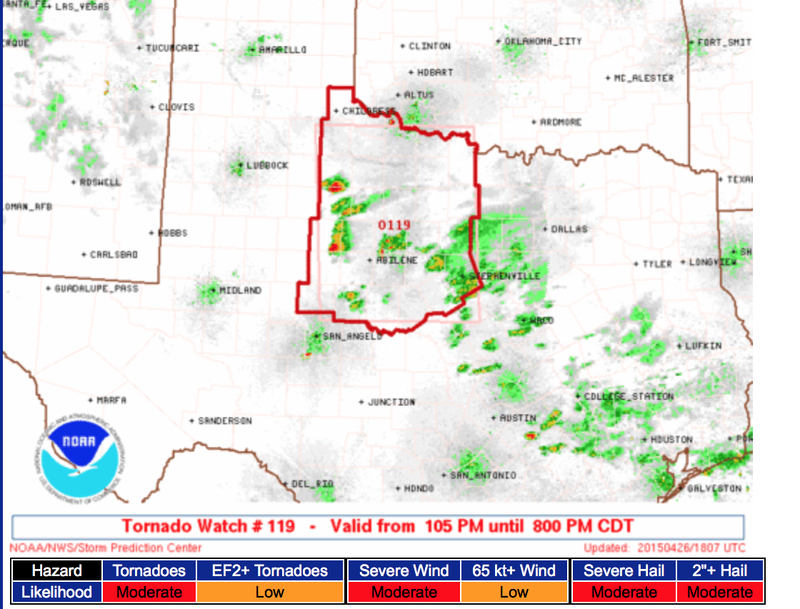 Tornado watch continues in effect. This evening, I am tweeting warnings and other information @usweatherexpert. The probability of tornadoes is "high" and violent tornadoes "moderate." The probability of ≥2" hail is also "high." Please scroll down to see the precautions I am recommending in this situation. 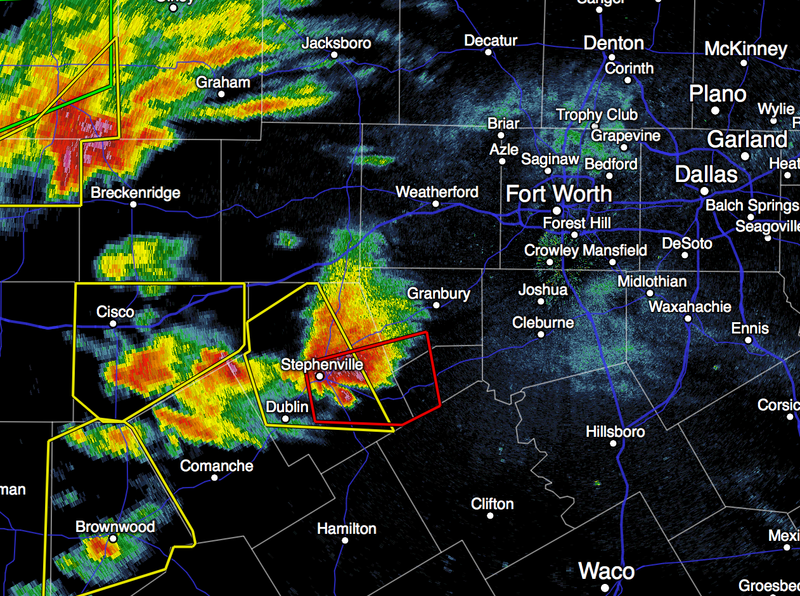 The large tornado warned storm is south of Stephenville, moving east. 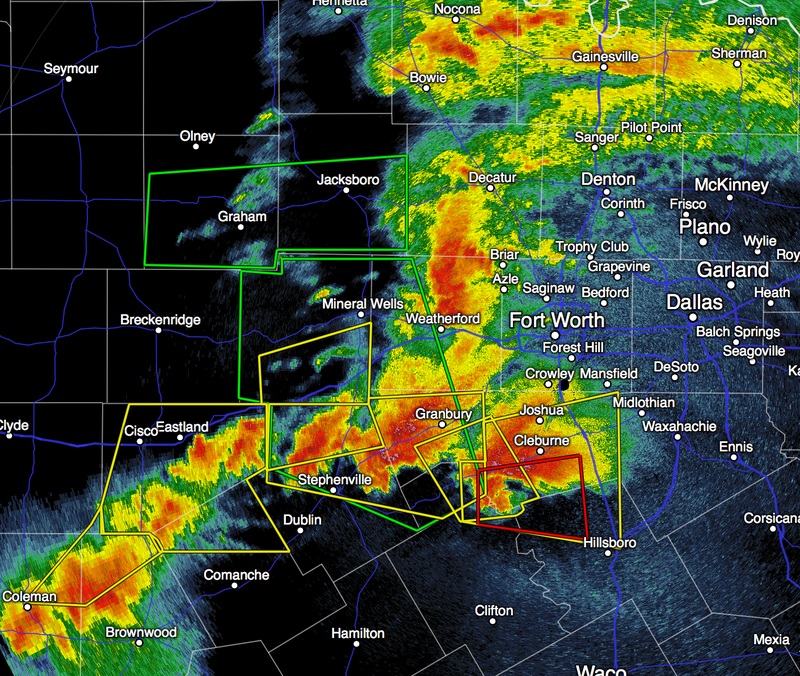 Other storms are now increasing west of the the Metroplex. These will need to be watched, also. 4:05pm, large tornado has been on the ground for a while. It is now passing south of De Leon, TX moving toward Dublin, TX which should be in shelter even though there is no tornado warning. 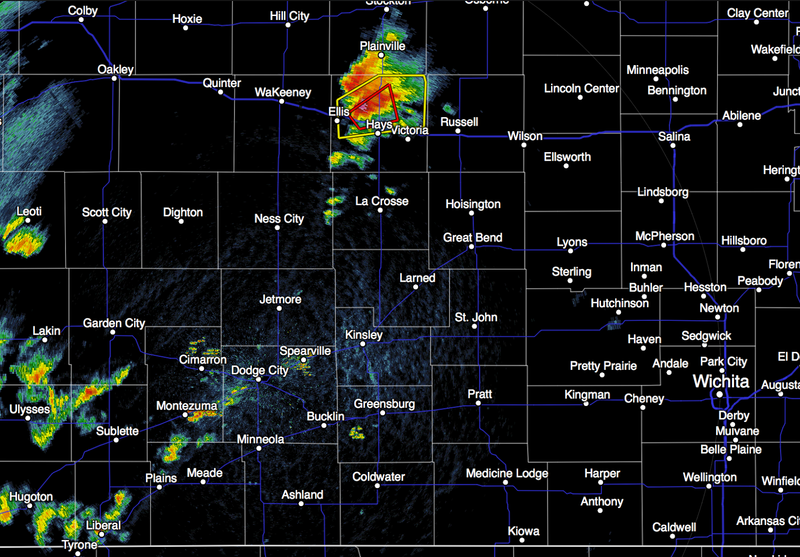 More storms are forming over the region and moving east. Radar 4:09pm. 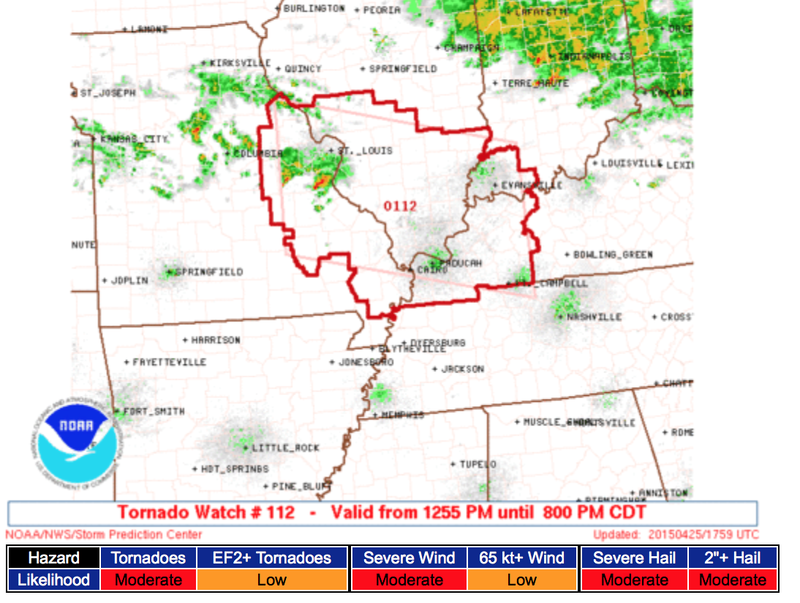 Tornado watch continues for the area. The situation is worsening in Texas. 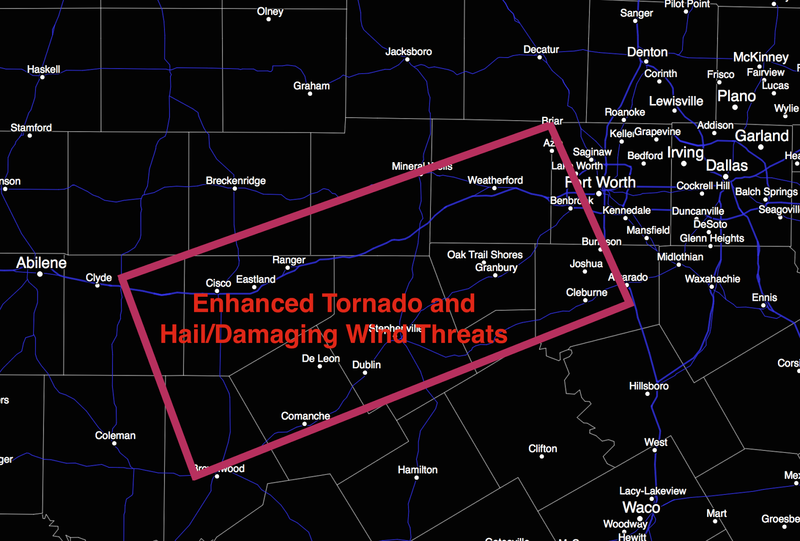 The area outlined is at especial risk of tornadoes and severe thunderstorms from now through about 8pm. 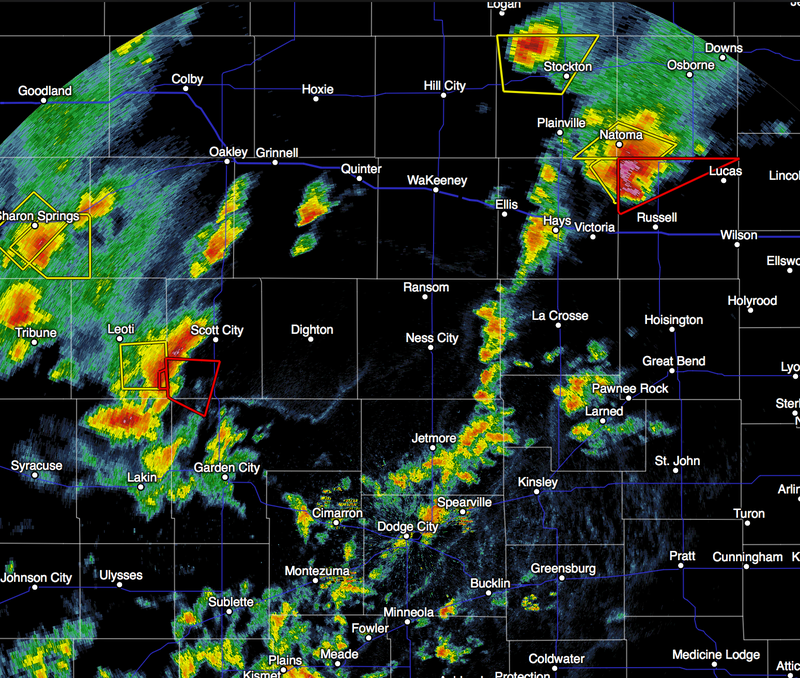 We now have two tornado warnings in effect (red polygons). Those storms are moving ENE. 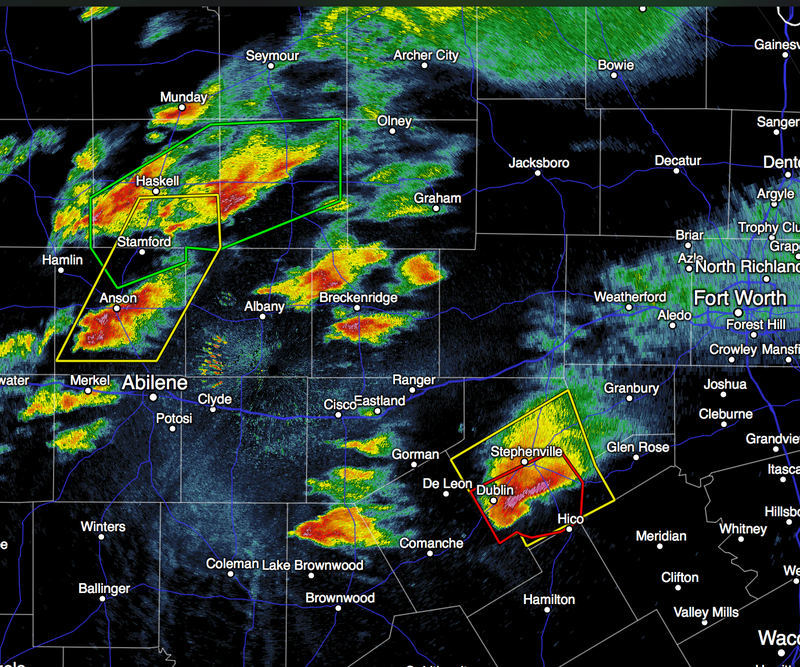 The tornado threat is increasing along with very large hail and damaging winds. I want to remind you one more time if you are east or ENE of these strong thunderstorms. So, how do you prepare, given this information? Keep your children and other dependents close by so they can get to shelter (preferably underground or in a safe room) quickly if a warning is issued. Make sure your friends and family in this region are aware of the threat. If you do not have a basement or safe room but a neighbor does, perhaps it is a good time to bring them a pizza or cake and see if they would allow you to share the shelter if a warning is issued. Make sure you have at least two ways of getting a warning (TV, smartphone app, radio, etc.). Put your car in the garage. Bring in lawn furniture, trampolines or anything else that can be blown about or damaged by hail. Fill your car or generator with gas in case of power failures. It is time to be monitoring the weather in this region and be prepared to take cover. 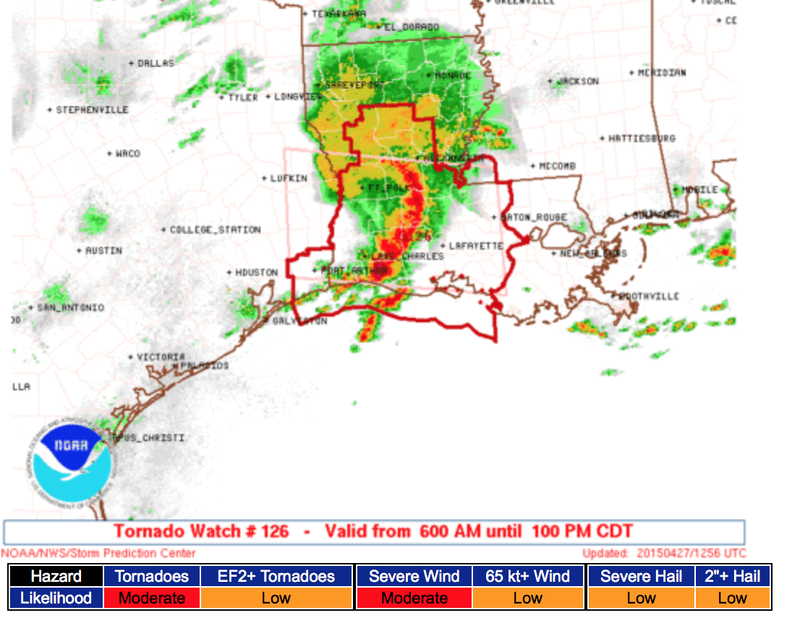 The first tornado watch of the day is out. This watch does not include Ft. Worth or Dallas. See safety rules in the posting immediately below. 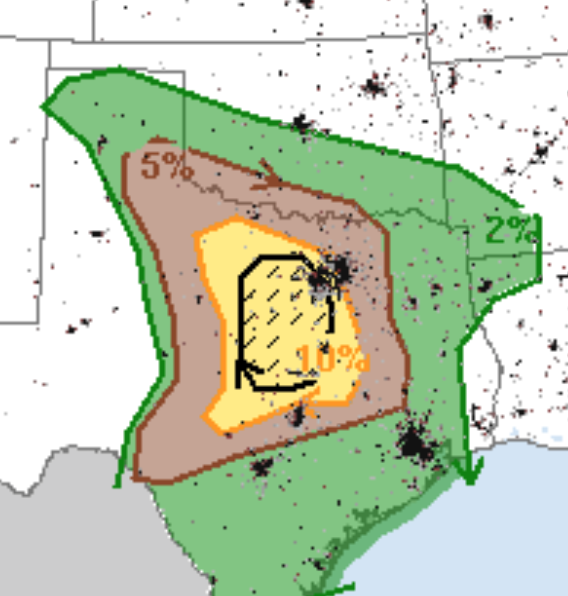 Since the earlier update, the NWS Storm Prediction Center along with AccuWeather's storm prediction model indicate a high threat of tornadoes in central Texas, including parts of the DFW Metroplex. Recall that a 5% chance of a tornado (brown) is the threshold of a significant threat. 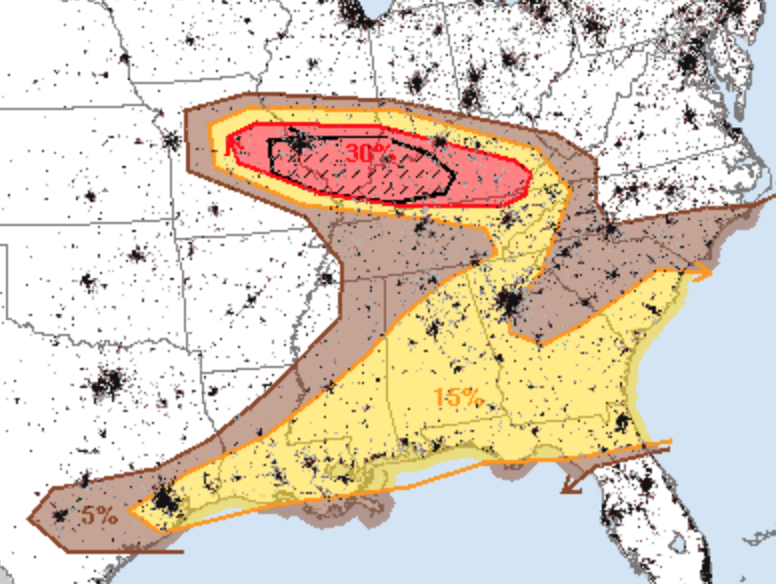 The hatched area is where violent tornadoes are forecast to occur. The threat level in the Red River counties in Oklahoma is unchanged. In addition, there is a major threat of large, damaging hail. For the hail forecast, 15% (yellow) is the significant threat. In central Texas, the threat rises to a high 45% of 1" or larger hail within 25 mi. of any given point. The hatching is where 2" or large hail is forecast to occur. Remember: The purpose of this information is not to cause worry but to allow you the time to prepare. I'll have updates this afternoon, please check back. 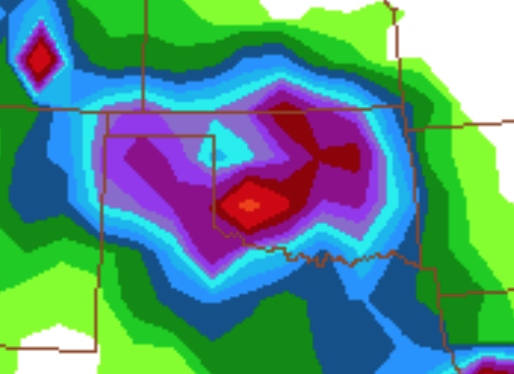 After months of drought, multiple computer models are forecasting 5 inches of rain in western Oklahoma during the next 36 hours. If you are in an area prone to flooding along small streams, you may wish to keep an eye out the next couple of days. Note: do not take the positions too literally. They are not exact. 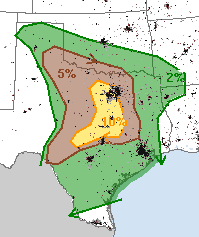 Keeping in mind that 5% is the significant threshold, there is an elevated tornado risk in much of central Texas. Keep an eye on the weather later today. My favorite part is the night portion. Enjoy! 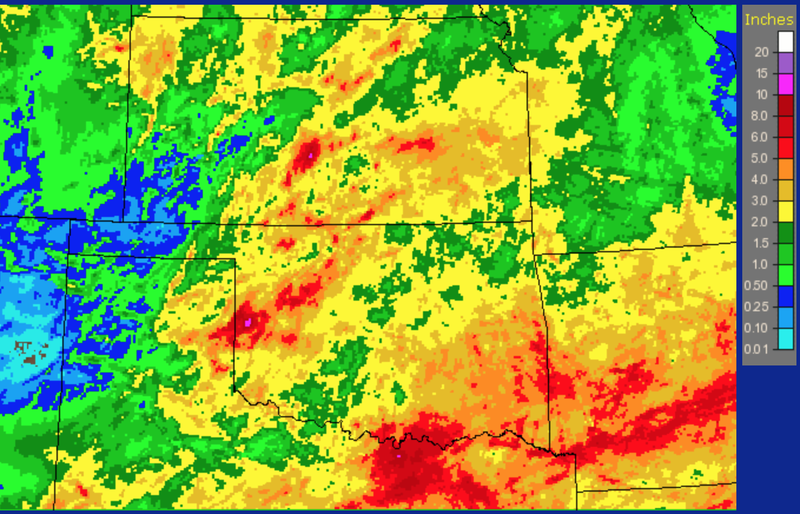 Here is the rainfall over the region for the two weeks ending at 7am CDT this morning. 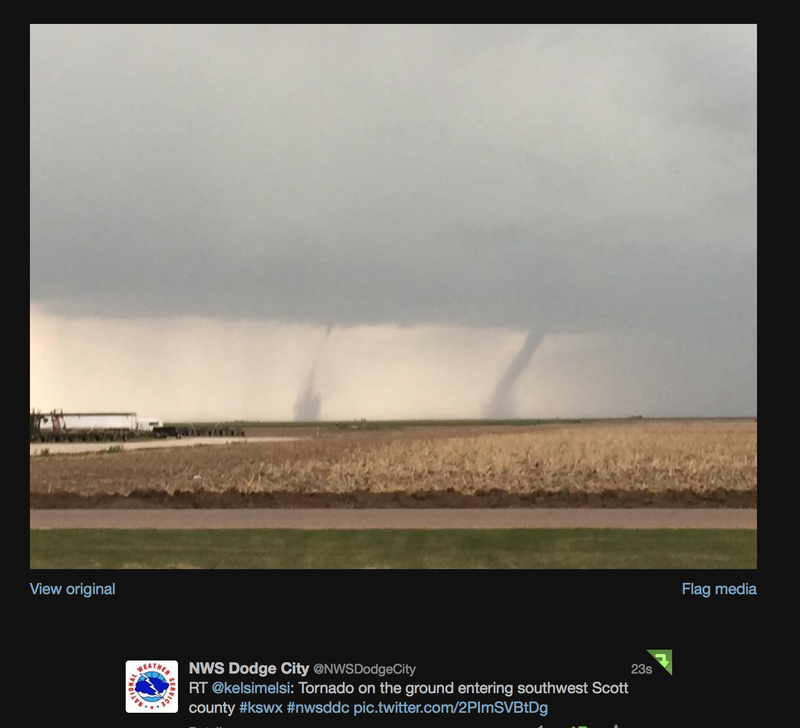 Early in each tornado season (February, March, April), I try to cover each significant tornado threat so as to get people back to thinking about tornadoes and tornado safety. By about this point in the season, I reduce the coverage to major events only. I'm posting this so no one gets a wrong impression if a storm threat is not on the blog. 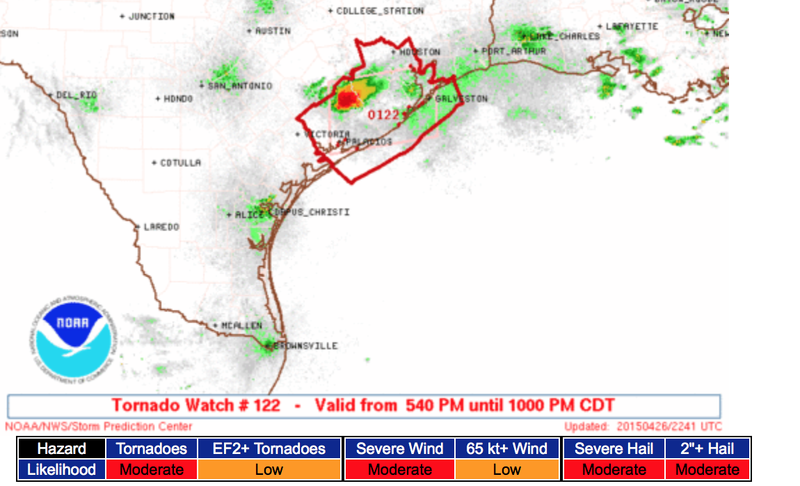 If you live in the tornado watch area, please keep up on the latest information. AccuWeather has extraordinary surveillance video of the Napal earthquake as it occurred. Click here. The motion you see in the trees and plants is not wind, it is the shaking caused by the earthquake. 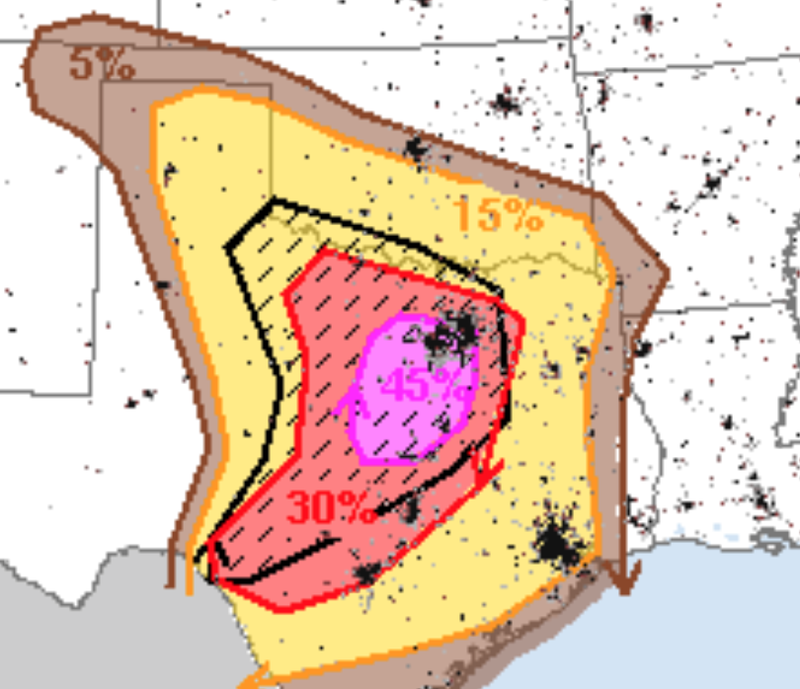 While there is a large area where 1" hail is possible (yellow), the hatched area is a forecast of 2" hail with higher probabilities (30% chance within 25 mi. of any given point). 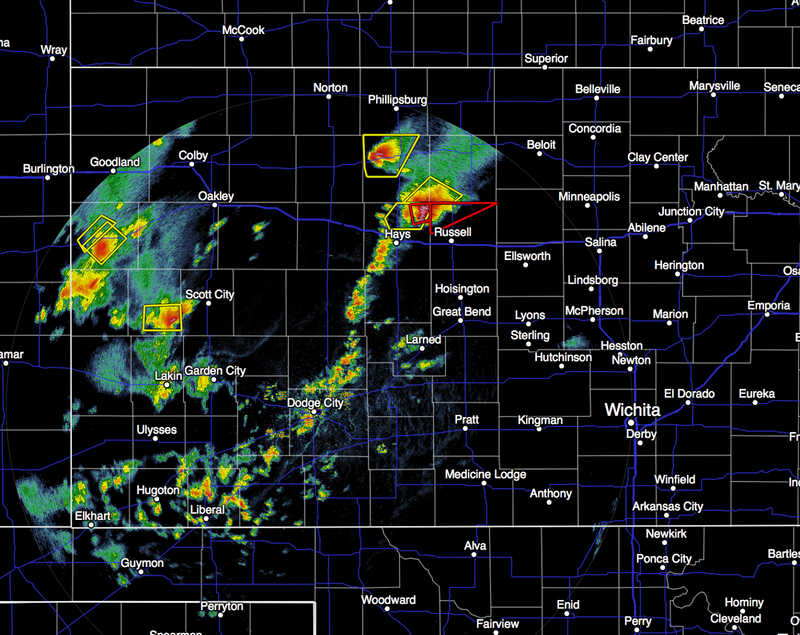 Unfortunately, while I will update a time or two, I will not be able to live blog the storms as I did yesterday. Please keep an eye out when thunderstorms approach. The storms the rest of the night are not expected to be severe. This ends my coverage for the night. Damaging winds are likely in the yellow polygon. More than 50,000 homes and businesses in the Metroplex are without power as a result of this evening's winds. 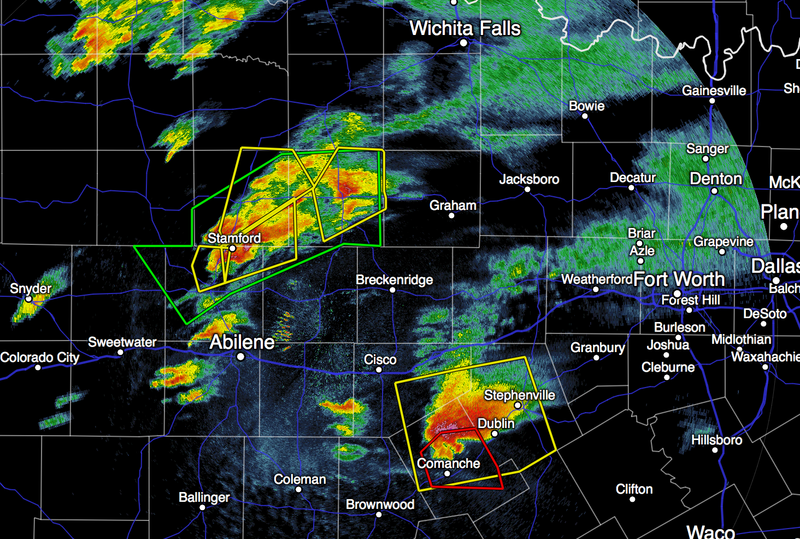 The tornado threat has lowered a bit, so this is the end of my Texas coverage for this evening. It looks like thunderstorms will be increasing in the outlined area in the next hour or two. Update 7:27pm. 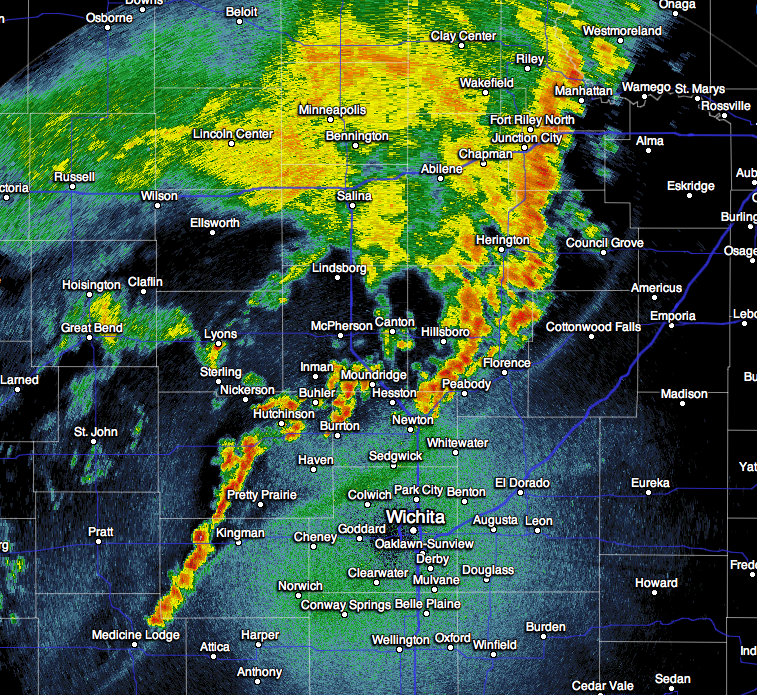 Radar at 7:23pm. 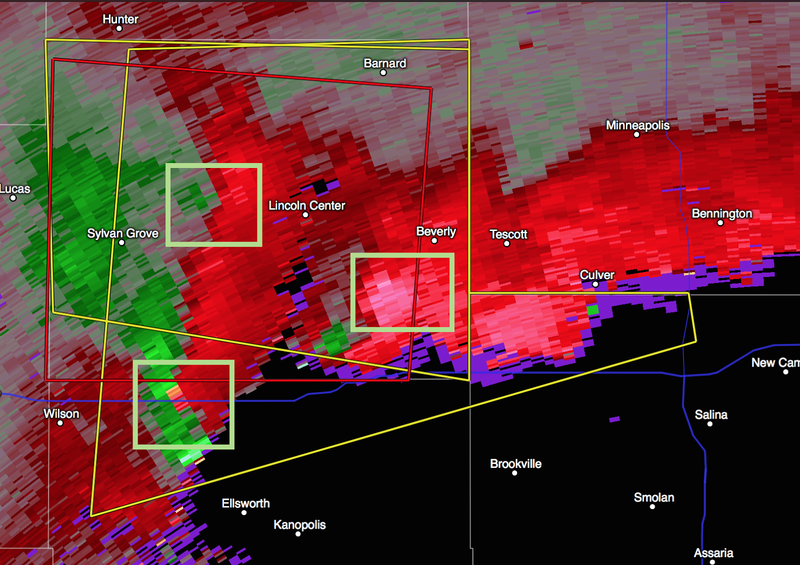 There are three areas of rotation but the rotation near Lincoln has weakened. 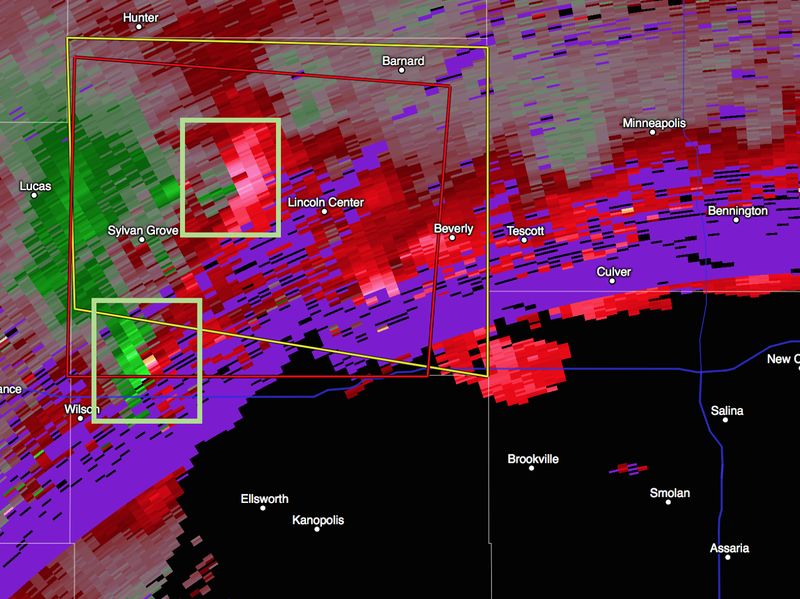 The two areas of rotation near I-70 are moving ESE. I would personally take cover if you live east or east southeast of the two southern rectangles. FYI: Salina is at lower right on the image for orientation purposes. 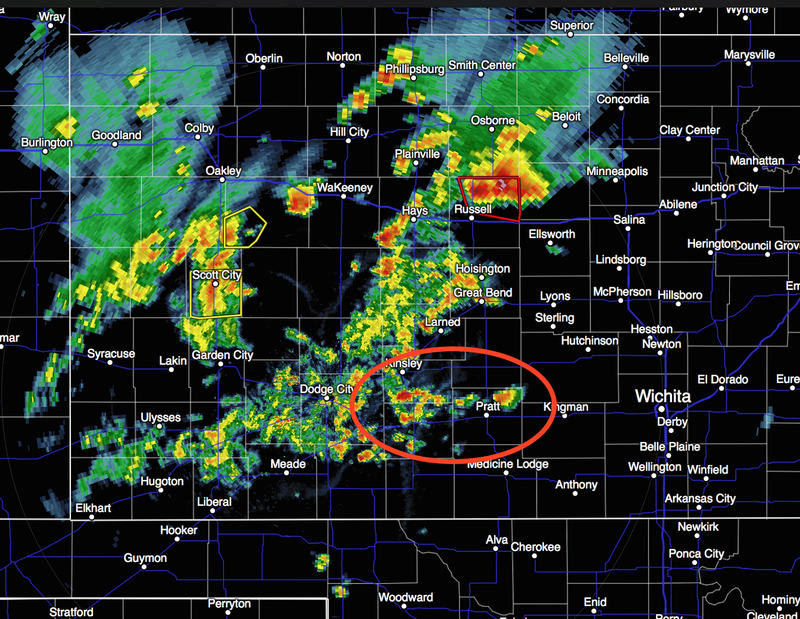 I've circled the rotation areas around Lincoln Co., Kansas. 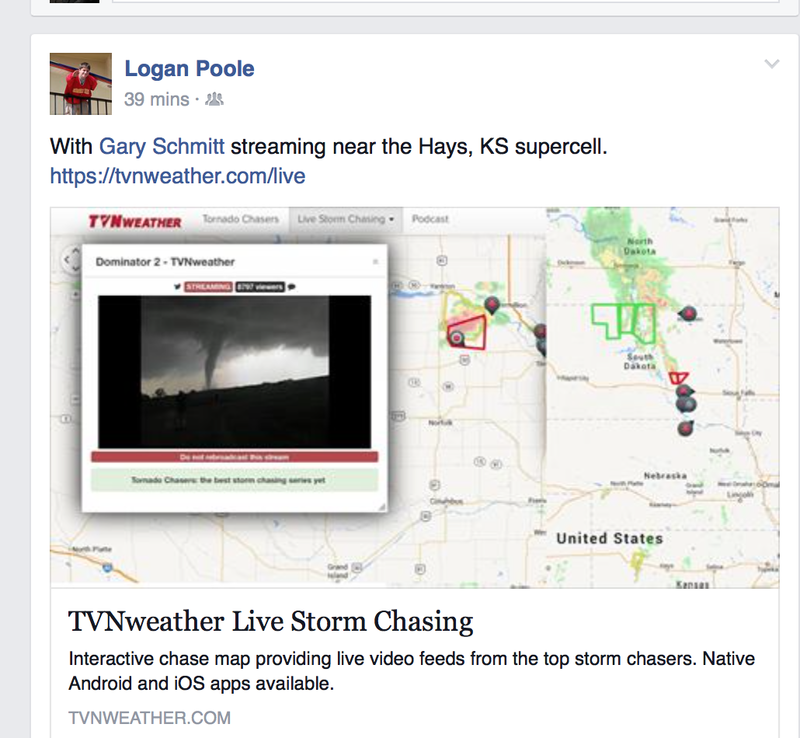 The northern of the two has already produced a large tornado based on recent photos from storm chasers. If you live east of the rectangles take cover now!! 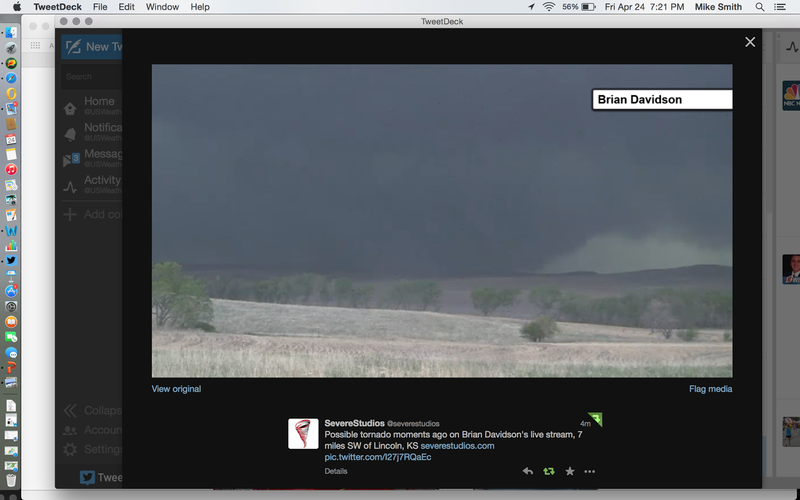 Photo of Lincoln Co. tornado from storm chaser via Twitter. Here is the latest on the threat of 60-70 mph winds. 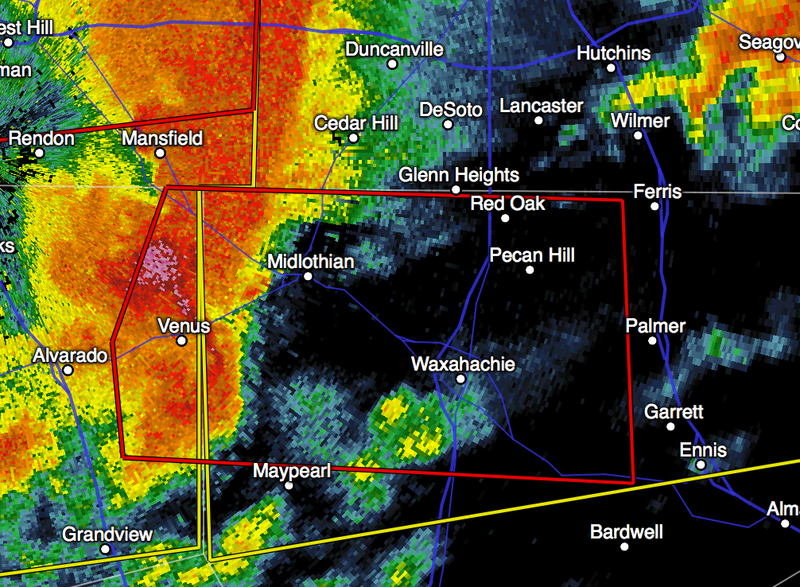 The tornado warning continues in the south Metroplex. The storm in western Stafford Co. (west of St. John) is now intensifying. The tornado warning for Lincoln Co. continues. The tornado watch continues for this region. Please keep up on the latest weather information. 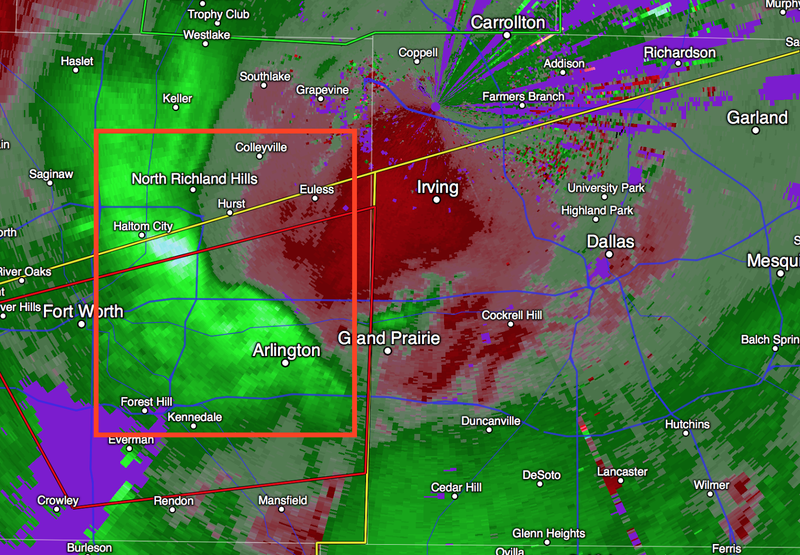 The highest winds are moving in the general direction of Irving. 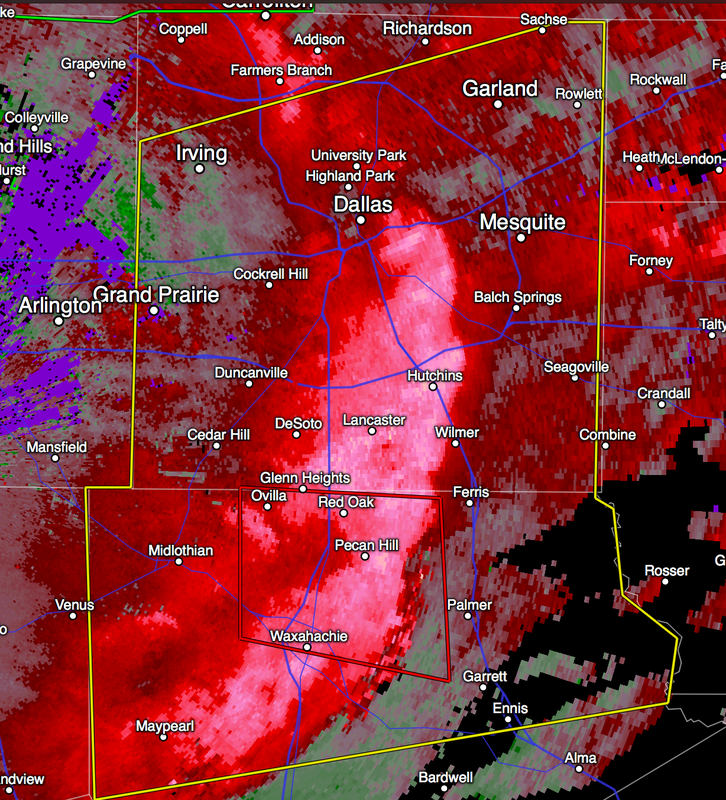 Western Dallas Co. should be prepared for high winds. Radar from 6:42pm. The strongest winds are in the orange box. A tornado warning (red polygon) is in effect for Tarrant Co. as radar shows at least two areas where brief tornadoes may occur within the area of very high winds. Take cover immediately! Dallas county: time to get indoors and gather up the kids. Meanwhile north in Kansas, the tornado warning continues for northeast Russell Co.
For the first time today, we are seeing rapid development of thunderstorms in south central Kansas. Stay tuned. 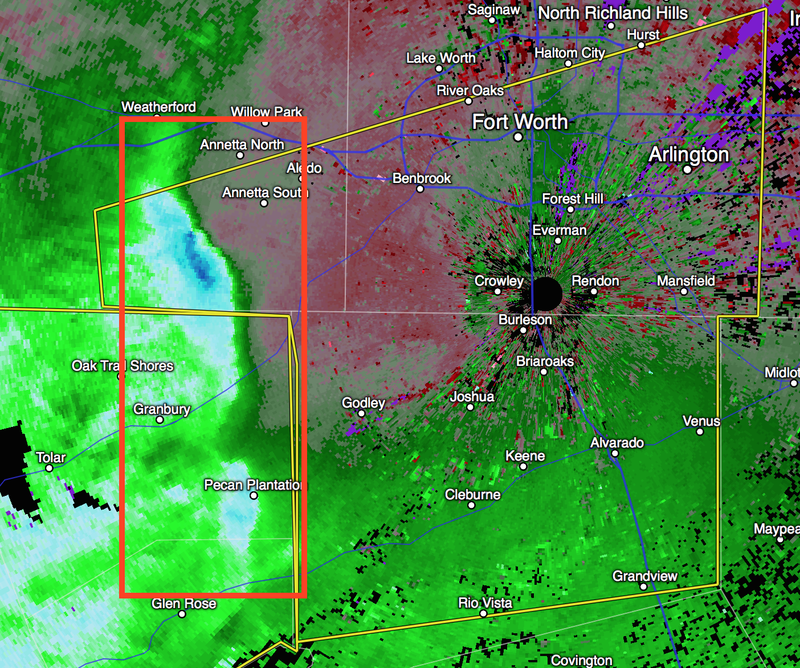 The area outlined in orange has very high winds moving rapidly east to ENE. Take cover in these areas as some gusts of 80 mph are likely. may have wind gusts of 80 mph or more. Severe thunderstorms with damaging winds are moving toward Tarrant Co. and should move into west and Sw portions of the county after 6:15pm. Please stay inside until these storms pass. 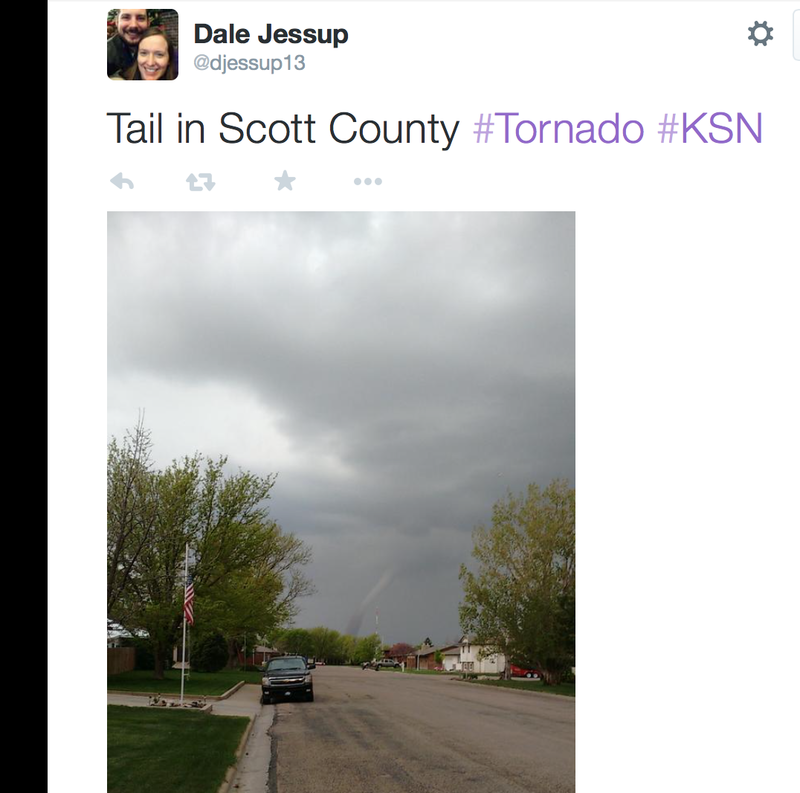 Dale Jessup sends this photo, via Twitter, of the tornado just north of Russell. 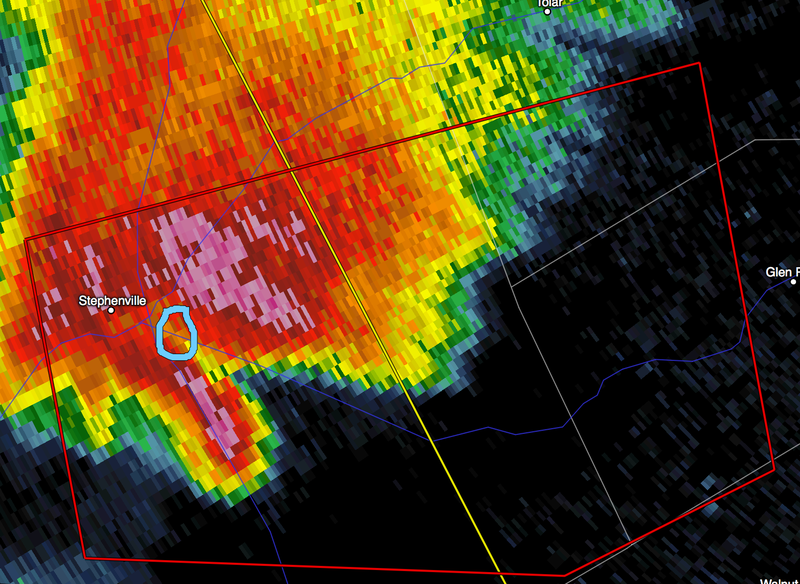 This is the tornado in the red polygon at left center. There is also a likely tornado north of Russell, just north of I-70. I tweet storm warnings and other information @usweatherexpert. Several brief tornadoes have occurred in Russell Co. the last 20 minutes or so. I expect the storms farther south to begin to intensify after about 6pm. 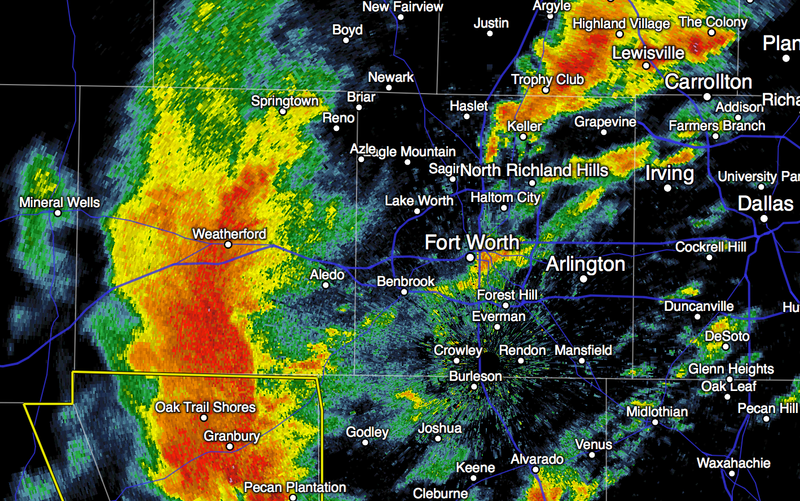 Storms are now starting to threaten the Metroplex. Please keep an eye out the rest of the evening. 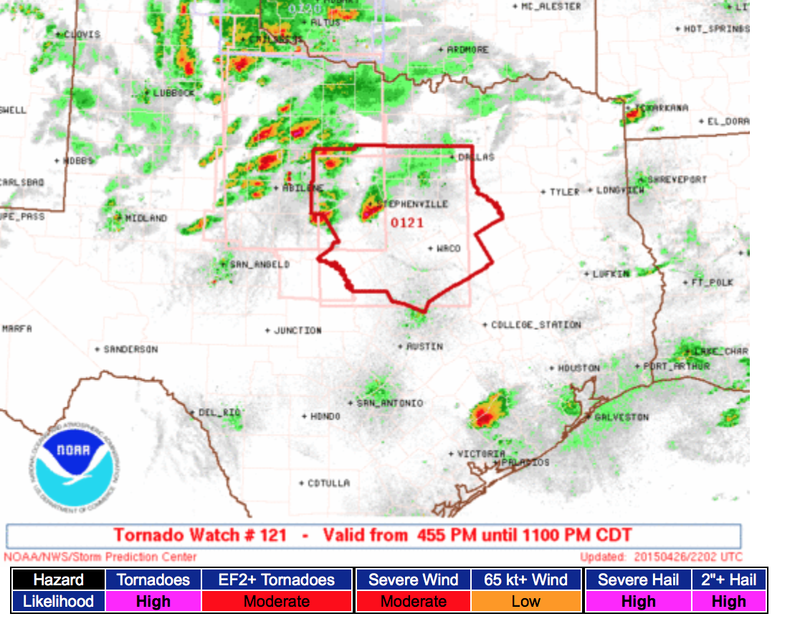 A new tornado watch has been issued. The risk of tornadoes is high. Please monitor local sources for the latest warnings! It is for northern Ellis Co. but does not include the City of Hays. A tornado watch is out for much of Kansas. Please keep an eye on the storms as they approach and be prepared to take cover. 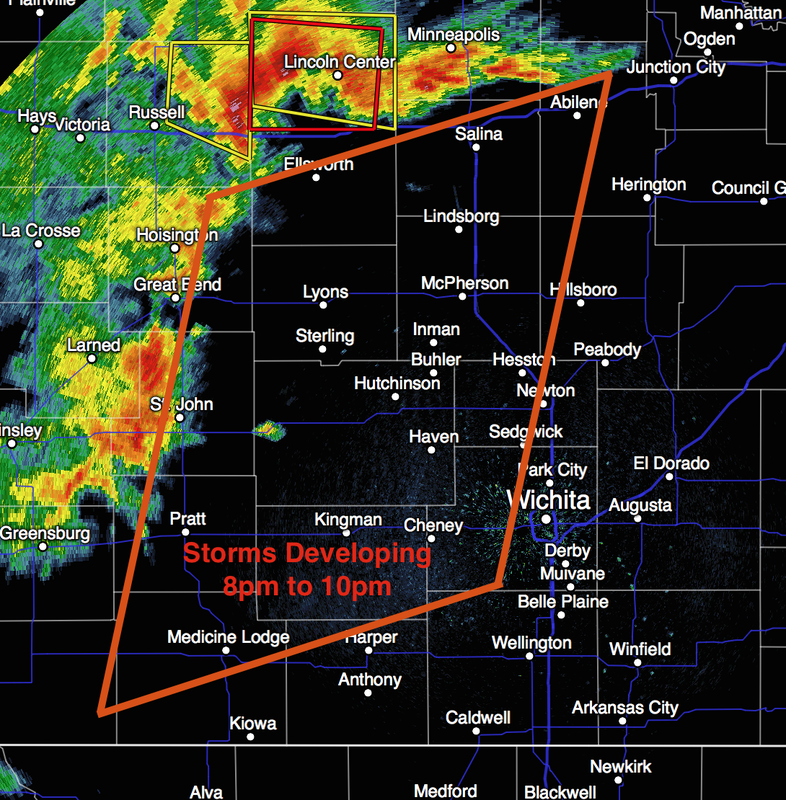 People in the counties along I-70 should keep a special eye out the next two hours or so. UPDATE: 4:55PM. There was at least one tornado earlier.